Many of these projects are joint work with other members of the Mobiquitous Lab, which I co-led with Dr. Mark Dunlop, or joint teaching supervision with Dr. Mark Dunlop or Dr. Andreas Lingnau. Embodiment in physical data artefacts through creative practice. Trevor Hogan's PhD project (started summer 2011 - moved to Bauhaus-Universität Weimar in 2014) investigates tangible data visualization and the role of embodiment in the user experience of physical data artefacts, taking a phenomenological perspective. Trevor is an external PhD student and a lecturer at Cork Instittue of Technology in Ireland. See tactiledata.net We have a number of shared publications, for example at HAID'12 and a paper on a new device/installation that embodies data from a space observatory at TEI'13. Multimodal Interaction and Museum Learning. Loraine Clarke's PhD project (University of Strathclyde funding) (started Oct. 2011). As part of her PhD work, Loraine Clarke built an installation for the 'Awakening Curiosity' Exhibition in The Ark, Dublin, which was shown May 14th to August 2012. We then began to collaborate with the Riverside Transport Museum in Glasgow on evaluating some of their new installations and recently on the development of novel installation ideas. As part of her PhD work, Loraine Clarke built this installation for the Awakening Curiosity Exhibition in The Ark, Dublin, May 14th to August 2012. 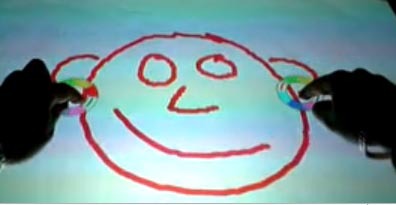 Children aged 5+ can colour in templates of various living organisms by painting with a paintbrush on a tabletop screen, and selecting colours by dipping it into physical paint pots. Templates are picked by selecting from a selection of physical tokens and inserting it into the table. Patrick Tobias Fischer's PhD project investigated interaction in urban space and exploring how to support 'urban encounters'. Tobias builds and evaluates installations for urban spaces and had a SICSA scholarship. (2009 -2013). He took a longer break for a Microsoft Research internship and some travels at a point. In his opinion urban settings frame social behaviors; but how should HCI anticipate that fact? How should HCI deal with public and semi-public space which is highly dynamic and complex? Tobias work aims to foster urban shared encounters, and to investigate design criteria for this problem space. Tobias work has resulted in publications at BritishHCI'10, TEI'10, TEI'13, and CHI'12 about his installations and the role of space for urban installations. He defended his theses in early 2015. Tobias Fischer is developing an urban intervention to explore people's reaction to an interactive object on a plaza that asks them to interact with the space around them. This project in collaboration with Mike Anusas from DMEM was funded by a BTG researcher-led investigation grant. 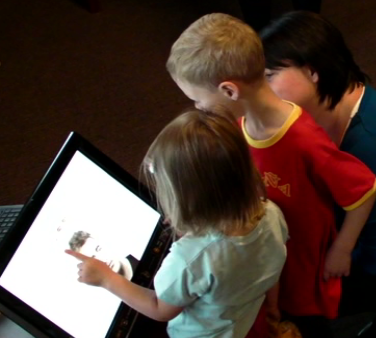 Over the summer of 2010 we conducted an evaluation study of touchscreen installation prototypes for the new Robert Burns Birthplace museum in Alloway, Ayrshire. Our research informed the design of the final systems and is funded by the National Trust Scotland. The target audience for the museum are British young families and so-called 'empty-nesters' and we solicited study participants from this demographic to participate in the evaluation sessions as a group. PhD student Emma Nicol worked on the project with Eva Hornecker and Mark Dunlop. We then did follow-up observational studies in the RBB museum, and compared user behaviour patterns between the user study (lab-style setting) and the in-the-wild behaviour in the museum, focusing on family interaction. Frøy's PhD project (funded by Rolls Royce Marine AS, Norway) investigated human computer interaction (HCI) within the maritime environment. The focus is on how new interaction styles can be introduced to make the interaction with Dynamic Positioning Systems (DP) more efficient and less faulty in both standard operations and in safety-critical situations. 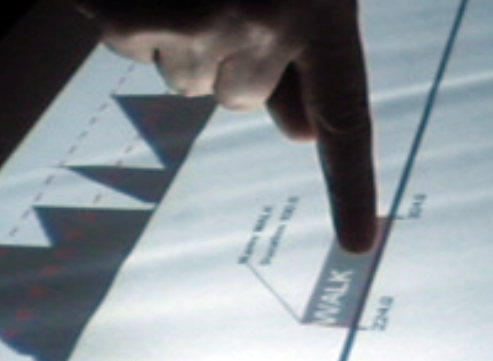 An initial experiment looked into how a DP operator could operate a DP system by using bi-manual interaction/ multi-touch combined with hand-gestures. The aim of this research is to investigate if multi-touch will enhance safety and efficiency in DP- operations, and enhance the user’s feeling of control. Frøy passed her viva in late 2010. We continued to collaborate, as Frøy now establishes a martime usability lab for Rolls Royce Norway and the Mobiquitous Lab has a consulting role on a Norway sponsored project 'Increasing Safety of Demanding Offshore Operations through Usability'. A joint journal paper for the Int. J. of Human-Computer Studies on Frøy's PhD work was published in 2012. Increasing Safety of Demanding Offshore Operations through Usability. User directed innovation project, collaboration with Rolls Royce Marine AS (Norway) on establishing a maritime usability lab. This collaboration builds on Frøy' Birte Bjørneseth prior PhD work at Strathclyde. Due to Eva Hornecker leaving Strathclyde, Dr. Mark Dunlop was involved in most of the work after the early phases. 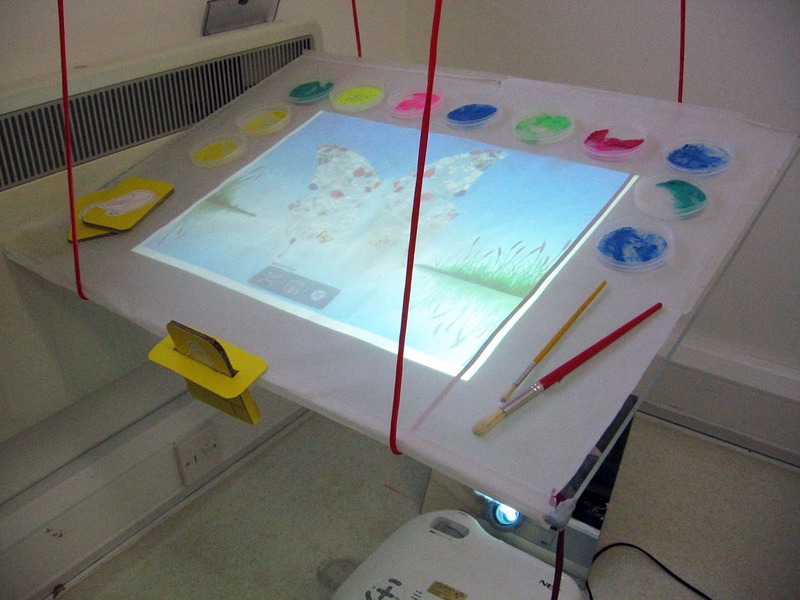 A group of MEng students in their 5th year built an interactive surface table in the autumn/winter semester 2009 as part of their project management course and developed a simple graphics program to illustrate the multi-touch capabilities of the system. 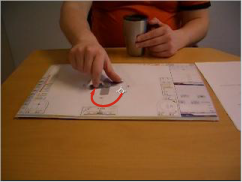 PainTable is based on ReacTIVision, and thus enables multi-touch interaction and detection of visual markers. We have since continued to work on and improve the table. 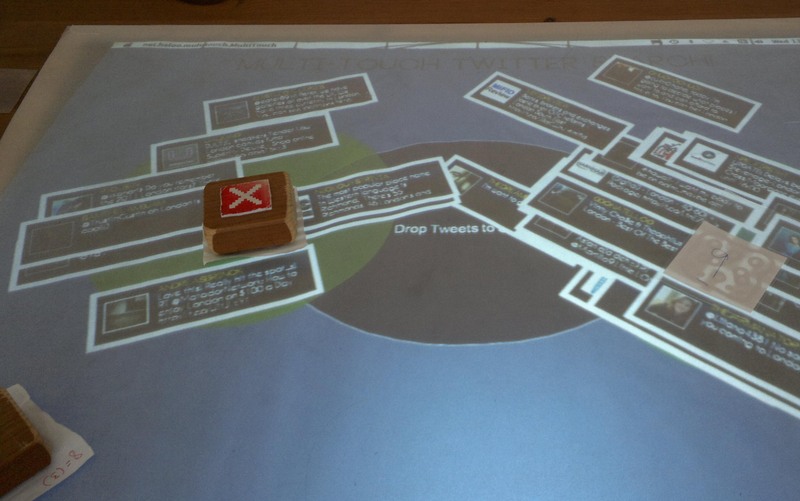 Kenneth Coyle's 2011/12 final year project (co-supervised with Andreas Lingnau from the PuppyIR project) develops a tangible tabletop interface for a Twitter application. We are interested in exploring non-linear views of twitter feeds and new ways of searching for tweets. This work has been presented at Mensch&Computer 2013 as a poster. Kenny has later assisted Loraine in some of the technical development for the ARK exhibit. Carrie Mc Crindle's final year project (2010/11) was a collaboration between the Mobiquitous Lab and the EU PuppyIR project, co-supervised by Andreas Lingnau. 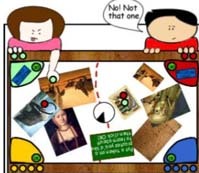 Up to 4 children can vote by placing objects with fiducials on the bottom on an interactive table on a topic they are interested in discussing further. The system then calculates the winning topics by counting the votes placed. The system supports several stages of voting, iteratively narrowing down the selection. This work resulted in an IDC 2011 short paper and poster. Max Pfeiffer spent Sept/Oct. 2009 as an intern at the University of Strathclyde and developed the prototpye of an interface for Mixed Initiative Planning on the Table, in collaboration with the Strathclyde Planning Group. Users can manipulate tasks/activities which are allocated to timelines (e.g. a machine, a staff member). The system calculates the resources this needs (e.g. energy consumption) and displays this. If the changes being attempted violate any constraints (e.g. order of tasks, time-dependencies), then the planner system will adjust the plan automatically (or indicate that the change is not feasible). 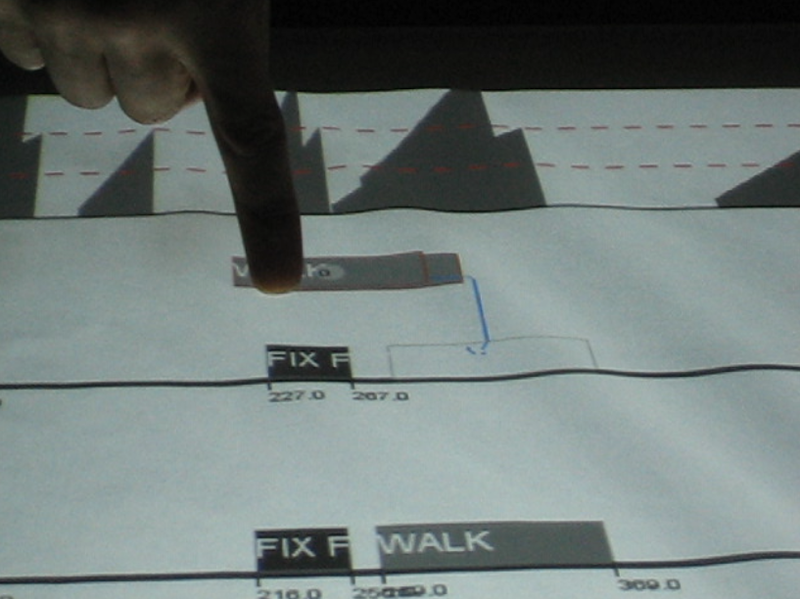 The project investigated issues concerning direct manipulation interfaces for planning systems and the design of multi-touch tables for planning tasks. An MEng Project team attempted to develop a whole body interaction system using wii-motes strapped to the body in the autumn/winter semester 2010. In the end limitations of wii technology restricted us but we succeeded in building a 5 wii-mote upper body system. This was before the Kinect was around - at the time it was a valid attempt, but the video clearly shows the limitations of accuracy (e.g. drift effects) and the ridiculous setup necessary for this. Victor Lee's 2011/12 final year CES project explored the design space of shape-shifting tangibles. The object gets larger depending on the data source it is placed upon, activating servo motors.